Bats are five point chart patterns that can signify either a bullish or bearish breakout is building. They are quite similar in appearance to the butterfly and crab but with slightly different ratios. Point D in the bat makes a shallower reversal than the other patterns and should make a retracement of about 88% of the distance XA. The bullish bat looks like a letter M and the bearish bat like the letter W.
Both bat types can be either reversal or breakout patterns. Look for a bullish bat in a bear trend as an indicator of a possible bullish reversal. Look for a bearish bat pattern in bullish trends as a sign of a potential bearish reversal. If the entire pattern is significant enough within the chart, the trend is less important. The retracements in price between each reversal point X, A, B, C and D are significant and are used to predict sentiment of the market. For a valid bat, B should retrace between 38% and 50% of the first move from X to A. Scott Carney, who first recognized the bat pattern, suggests that a 50% retracement at B is the best signal. In a bullish bat, C can retrace up to 88% of AB, but it shouldn’t break higher than point A. And, in a bearish bat, C can retrace anywhere up to 88% but shouldn’t break lower than A. The final point D is where the pattern ends and the breakout reversal is expected. If the other points are in alignment, then point D should be at about 88% of XA. For a bullish bat, check that point X makes a significant low. And for a bearish bat, that point X is at a significant high. The time between each reversal should be approximately the same. 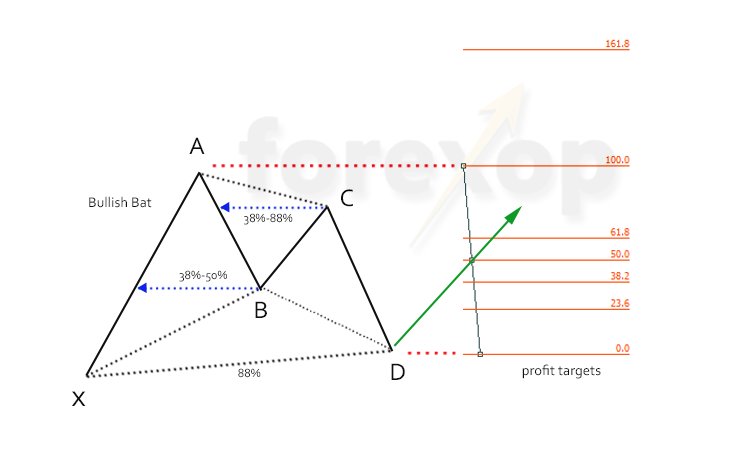 In a bullish bat, the profit targets are normally set at the Fibonacci lines between A, the pattern high, and point D.
To reveal the profit targets, use a Fibonacci retracement tool and select point A to point D. The main price targets are at levels 38%, 50%, and 100%. 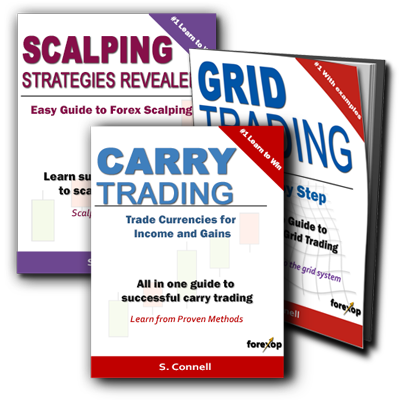 Use the lower profit targets as trade entry levels for pending orders. Place a pending buy stop order to fire if the price reaches the first target at 23%. This way if the reversal happens at D as expected for a bat, the first order will execute on a bullish break. Otherwise set the pending order to expire. If the price at D does drop beyond the expected reversal area, the pattern could be a crab or butterfly where the price falls by up to 162% of XA. When trading a bat, increase the position size only if the trend extends towards the higher profit targets. This way if the breakout does fail, you can limit the losses. Use the same method to find the targets for a bearish bat. For a bullish bat pattern set the lowest stop loss at a price not lower than X. That triggers a sell order to close the entire position if the reversal at D extends more than 100%. In a bullish bat, raise the stop losses and profit targets for each order (lowered for sell orders) only if the trend extends higher. If the price does break upwards, move the initial stop loss higher to point D. If the price breaks below D after an initial rally, a bearish continuation could be on the way. In patterns of any size, the price levels at X, A, B, C and D will often turn into areas of support and resistance (see Figure 3). So this information should figure in deciding where to place your stops and profit targets. A bat can appear as part of a trend, but patterns that are large enough can be structures that stand on their own. 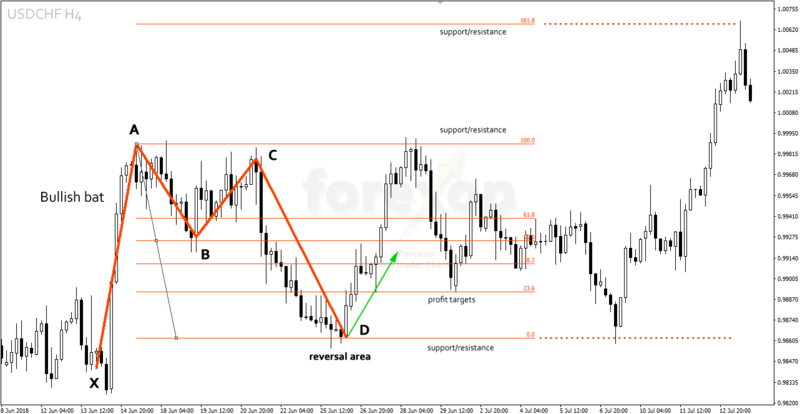 The chart below, USDCHF H4, shows the latter in which a large bullish bat appears. After point X, A, B and C are known, for a valid bat the predicted reversal area is at an 88% retracement of XA. This reversal area is marked on the chart. A reversal does occur at D, and this confirms the bullish pattern. The horizontal orange lines on the chart show the Fibonacci levels between point D and point A. These are the profit targets and order entry points. As predicted, these levels do create regions of support and resistance, particularly around the key levels at 0%, 100%, and 162%. After the initial breakout at D, the price rallies to the 100% retracement level before tumbling back to D again. A spit entry system here allows you to capture profits if and when the breakout progresses. With each of the trade entries from D, raise the stop and profit targets only as the trend moves higher. This way when the pullback occurs, you retrain some profit and the downside is limited by the trailed stops.